The S5 is one sinister-looking performance coupe, especially when finished in Phantom Black Pearl Effect, which was the color of my test model. The S5 has a flowing character line that bends smoothly along the body sides, but perhaps its most distinctive design cue is its LED daytime running lights. Used on other models, including Audi's S6 performance sedan, the row of LEDs emits a bright white light that grabs the attention of oncoming drivers in a way those now-ubiquitous daytime running lights no longer can. 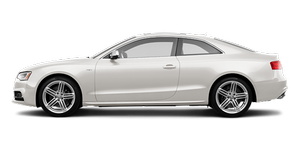 Even though the S5's lines are essentially the same as the A5's, a number of subtle cues will tip off informed bystanders to the fact that they're looking at an S model. Details include a revised grille, silver-colored side mirrors, quad tailpipes and unique 19-inch alloy wheels, in addition to S5 badges.